This sleek dress comes in a stretchy ponte knit fabric that’s ultra-flattering. We added faux-leather piping and an exposed back zipper for a lengthening effect too. Made in NYC. Long, slim fit that falls above the knee. We recommend sizing up in this dress if you don’t like things too tight or you are in-between sizes. Our model is 5’9” and wearing a size 4. 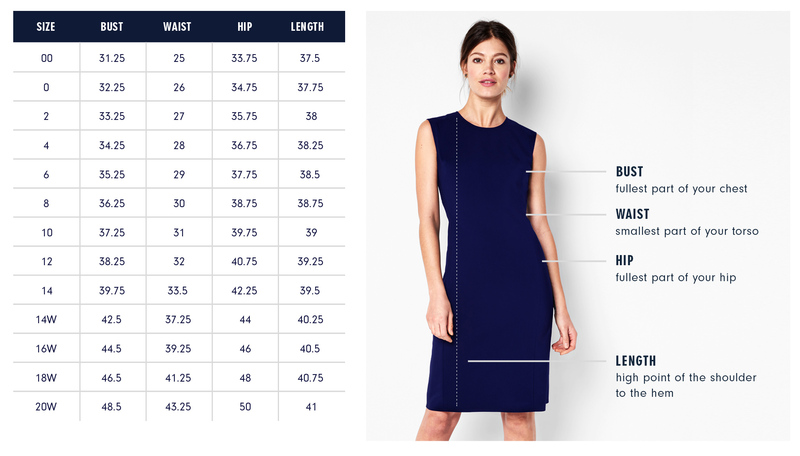 Below are the exact measurements of the Bowery Dress. All measurements are in inches. For general brand fit, sizing, and measurements, please visit our Brand Fit & Size Guide. Long, slim fit that falls above the knee. The piping on this dress is such a fun and flattering design element. The piping is inset so it lays flat to the body (usually it would be sewn on top of the dress fabric. I very carefully contoured the piping for a slimming effect. And I made it faux leather for a just a little edge. Features: Crew neck and contoured armholes for coverage and movement. Exposed back zipper.